La Mezquita (Mosque-Cathedral of Córdoba) is captivating. It brings hordes of tourists to this Andalusian town annually. 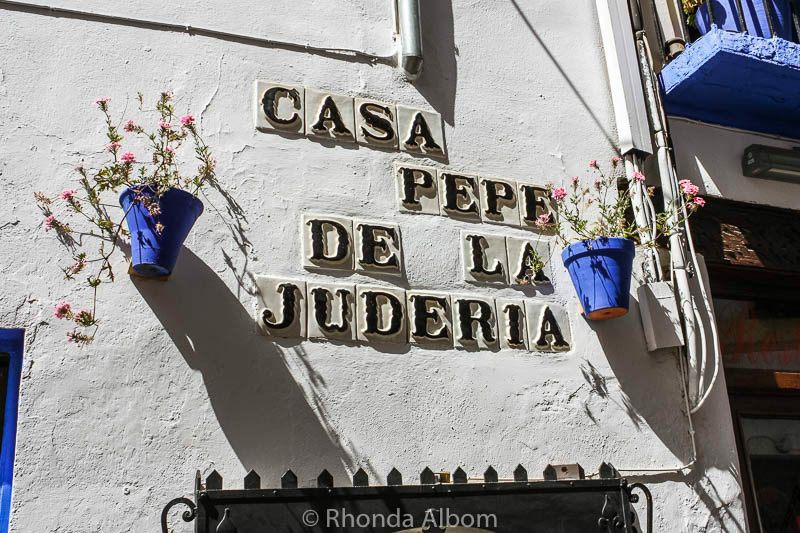 It is one of many interesting things to do in Cordoba Spain. If you only have one day in Cordoba, you will be busy. The red and white archways captivated my attention from the moment we entered. The contrast between the Moorish architecture and Catholic artefacts somehow blend seamlessly. As a result, the structure feels endless. It is a visual treat around every corner. It remains the largest structure of its kind in the western Muslim world. La Mezquita is one of the most amazing places I have ever been. While we marvelled at everything we saw, we know we missed quite a bit by not having a guided tour. If I ever get back, I will have a guide. 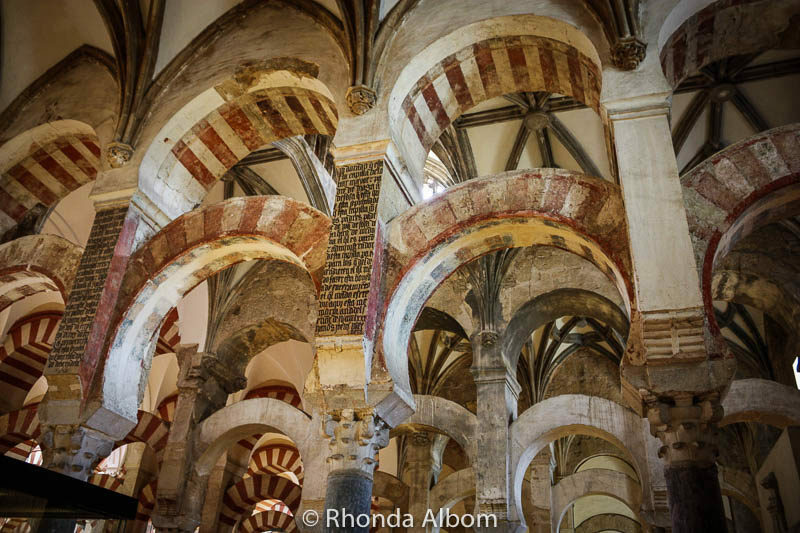 My top choice is a 2-hour tour of the Cordoba Mosque-Cathedral has an art historian guide and skip-the-line ticket. Initially built as the Catholic Basilica of Saint Vincent of Lérins. In 711 AD the Muslims conquered Spain. The Christians and Muslims shared the church, each occupying half of the building. 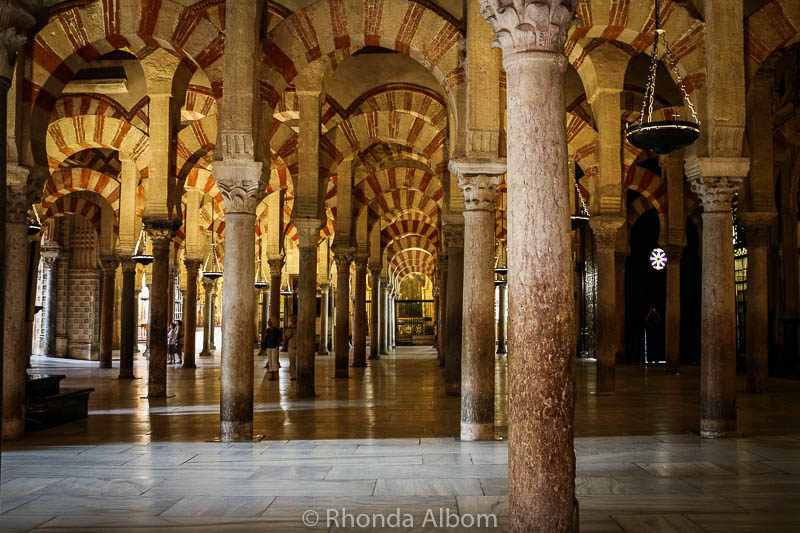 Construction of the Grand Mosque of Córdoba began in 784 after the Christian half was purchased and demolished. Córdoba returned to Christian rule in 1236 during the Reconquista, and the church converted to Roman Catholic. Now it is a UNESCO World Heritage Site. At the centre of the maze of narrow streets that make up the Juderia. This medieval Jewish ghetto is home to one of only three original synagogues remaining in Spain. Built in 1315 in the Mudéjar-style it was transformed into a church in the 16th century, only to later be rediscovered in the 19th century. 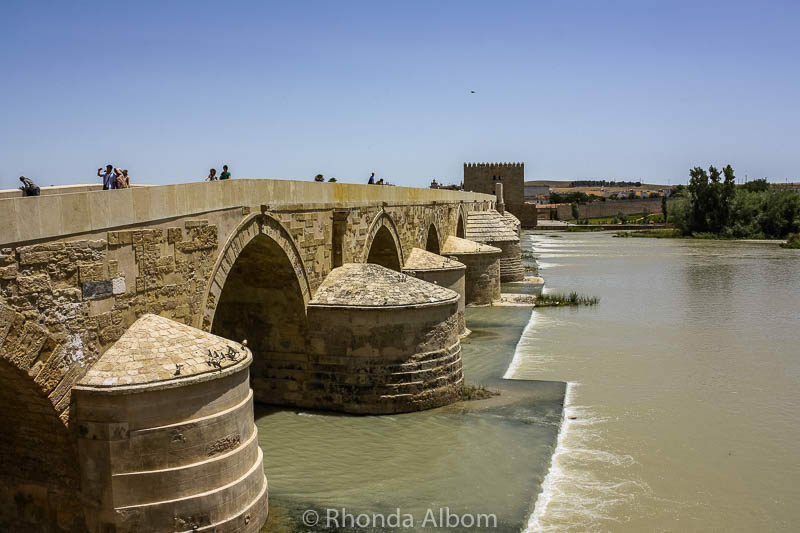 The Puente Romano (Roman Bridge) is a 16-arched bridge spanning the Río Guadalquivir. It was originally built after Caesar’s victory over Pompey the Great. With renovations and reconstructions over time, it barely resembles its Roman roots. If it looks familiar, perhaps you recognise it as the Long Bridge of Volantis from Game of Thrones: Season 5. The tower at the south end is a fortified gate built during the late 12th century to protect the bridge. Today the tower is Museo Vivo de Al-Andalus, a museum highlighting the cultural achievements of Al-Andalus. Standing on the Roman Bridge, looking to the south. The Torre de la Calahorra (tower) can be seen sticking up at the other end of the bridge. 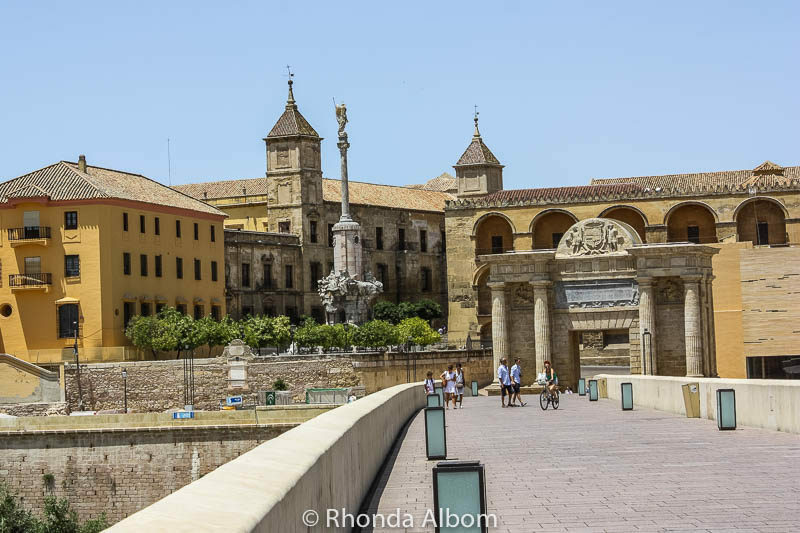 Standing on the Roman Bridge, looking to the north towards the city gate and the pedestal topped with The Triumph of San Rafael de Glorieta of the Count of Guadalhorce dedicated to the archangel San Rafael, angel guardian of the city. Let the speed of the dancer’s feet at a Flamenco show mesmerise you. (be sure to read the reviews on the page if you are unsure. Visit the Alcázar de los Reyes Cristianos (The Alcázar of the Christian Monarchs), a former Caliphal Palace. It later became the residence of Queen Isabella I of Castile and King Ferdinand II of Aragon and the location where they met Christopher Columbus as he prepared to take his first voyage to the Americas. Let the lush nature and fountains relax you at Jardín Botánico de Córdoba (Cordoba’s Botanical Garden). Unwind with a hammam bath (a different and much more relaxing experience than the hammam bath we had in Morocco). Increase your understanding of Spain’s controversial sport at the Bullfighting Museum. Explore the 12 patios and fountains of Palacio de los Marqueses de Viana. If you prefer a full city tour, there are several reputable companies offering Cordoba Spain tours, as well as the option of a hop-on-hop-off bus. Cordoba is in southern Spain about 150 km north-east of Seville. 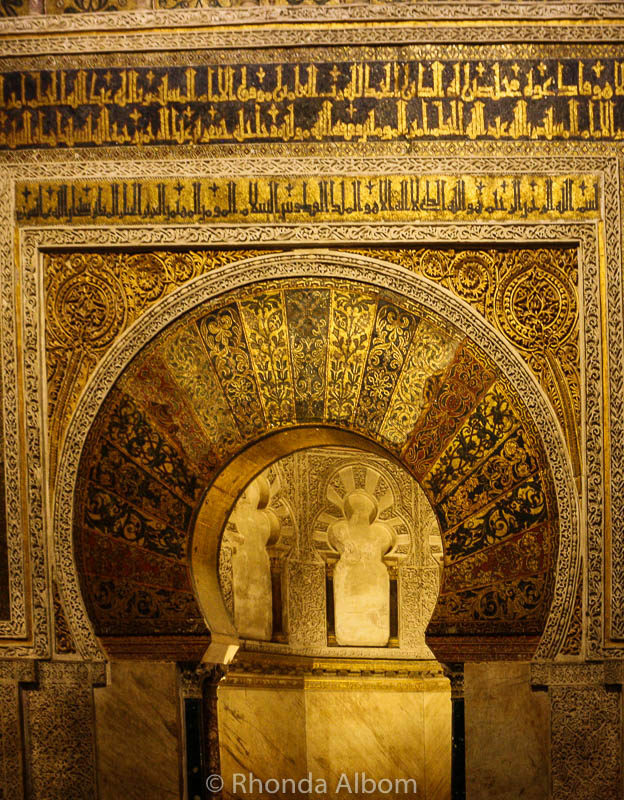 La Mezquita’s published opening time is 10 am, but if you arrive between 8.30 and 10 am entry is free. Other early birders have mentioned that they had to be out by 9.30. However, we had free entrance at arriving at 9.55 am, and we stayed until we were done. We stayed at Hotel Mezquita, an affordable Andalusian house style accommodation directly across the street from La Mezquita. Surrounded by historic buildings, our hotel was clean, colourful, and had a larger than average room for our family. For us, it is the perfect place to stay. Parking for La Mezquita and the nearby hotels (including Hotel Mezquita) is several blocks away from the entrance. This article is part of a series highlighting a driving loop through Spain and Portugal that both started and ended in Costa Brava. Our key stops included Saragosa, Madrid, Segovia, Toledo, Cordoba, Granada. Then in Portugal, we visited Evora, Sintra, Obidos, and Alcobaca before returning to Spain: Vigo, La Coruna, Santillana del Mar, and San Sebastian. 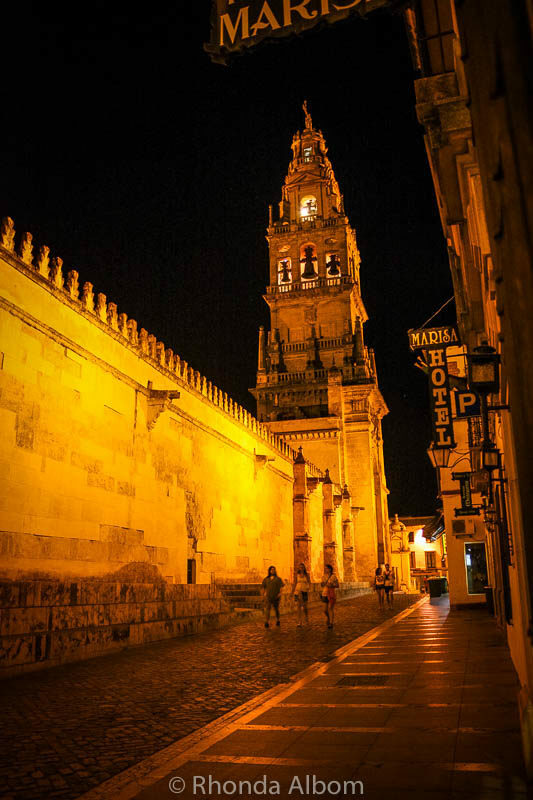 If you had only one day in Cordoba, which of these would you visit? They all look enticing but I particularly like your nighttime photos! Thanks. I love taking nighttime shots. They are all handheld on this page. 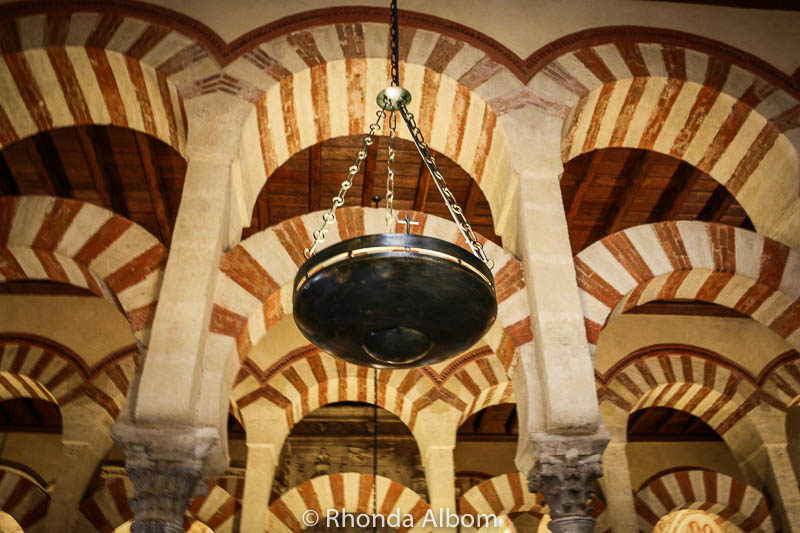 I would most likely visit La Mezquita if I had only one day in Cordoba. However, it would be a difficult choice considering how beautiful the other sites are too. We passed by Cordoba on our way to Toledo some years ago when we went to Spain, but didn’t have enough time to stop and visit. I’d love to go back though. 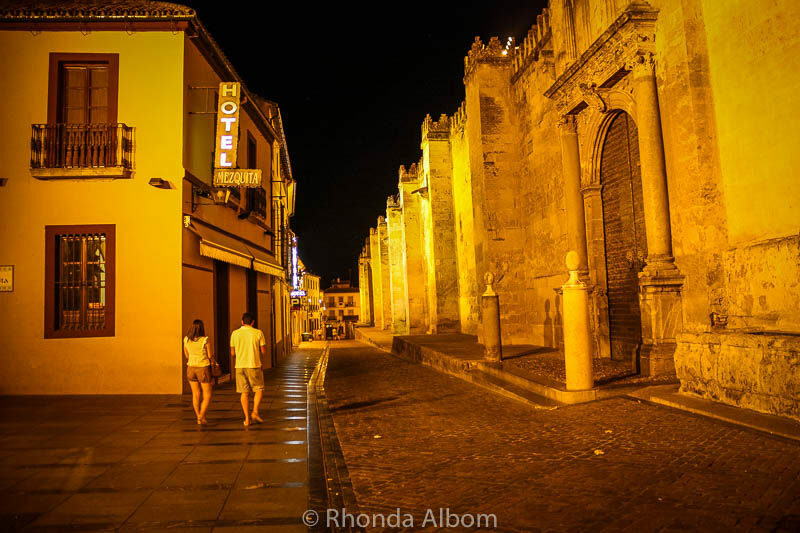 We drove to Cordoba from Toledo, staying at least a night in both. Yes, imagine how smart the world would be if we could all go back and have our younger selves listen better. Thanks Claire, I hope you get to Spain someday. What a great adventure spending so much time exploring Spain! I’ve visited Barcelona, but would love to see Cordoba and Madrid! Thanks for sharing these gorgeous photos again! We had two home exchanges in Spain, one long term in Palamos (Costa Brava), the other in Galicia. 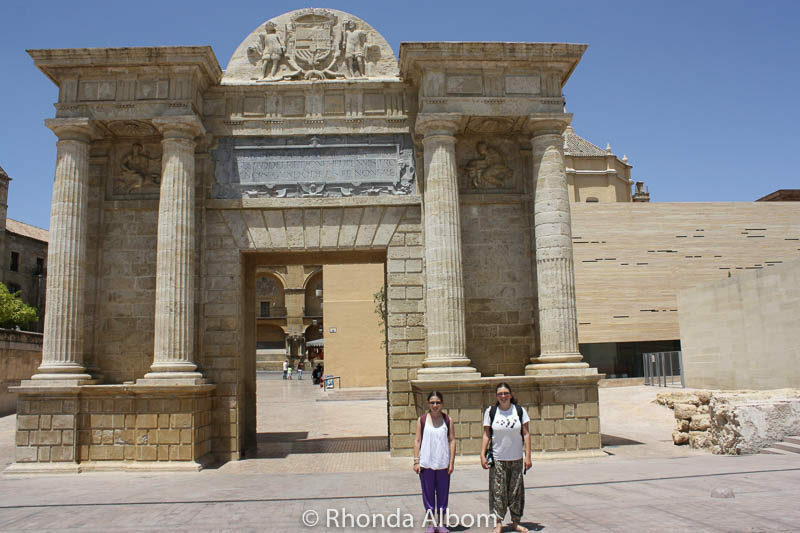 We visited Cordoba as we travelled between the two. It is one I would highly recommend. 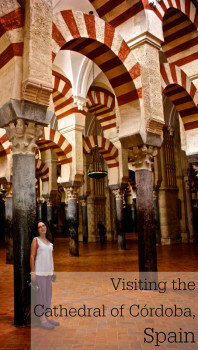 As soon I have seen the picture I knew, our Mezquita in Cordoba!!! so stunning buildins, isnt it? The photos are spectacular! Have a great week Rhonda! It is such a distinctive icon. I think anyone who has been there, recognises it instantly. That bridge is such interesting architecture. You make me want to visit Spain! Your night shots are stunning. We usually get up early on our travels and by after dinner, we are zonked and miss out on the city lights. Time to change that up now and then! We saw a church with similar colours in Western Australia. It turned out to be modelled after this one. With such an interesting history. Gorgeous photos! I would love to visit the Roman bridge. There are interesting things on both ends of the bridge. How i wish i can also see those you showed us! They are truly amazing and very impressive, and your photos are so beautiful. Thanks. Maybe one day you will get to. Oh, man…it’s so beautiful. With only a day, I’d probably just wander the streets and stare at everything. But, choosing from the above, I imagine I’d visit the cathedral. I hope you would take time to go into a few places. Such a pretty place! I imagine this building took forever to construct with all the detail! I am sure it did, and then it would have been modified each time it was taken over. What beautiful pics. What a lovely place to visit. I would love to visit there. I hope you get a chance to tour in Spain some day. I went here in 2009 and we really love to walk around La Mezquita. It is such a beautiful, historical place. The best thing about the old places is that they never change. Wow! So many wonderful photos! 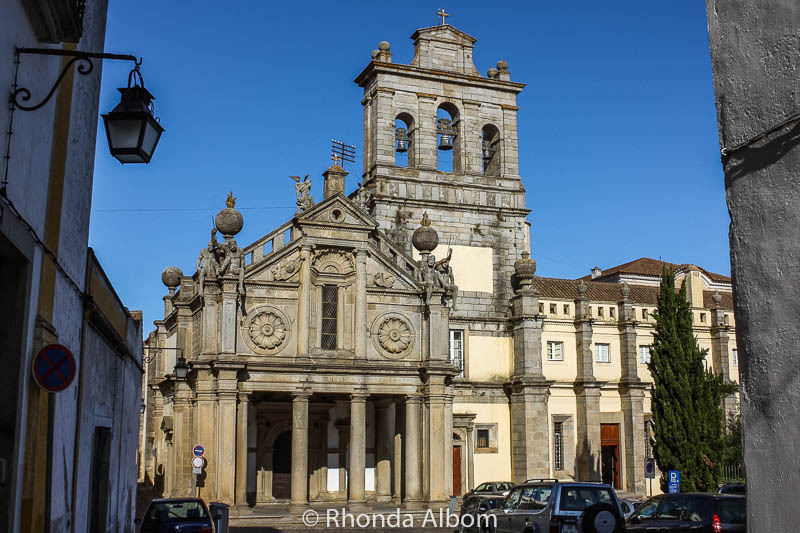 Boa tarde, gostei de conhecer o seu excelente trabalho fotografico, as fotos são magicas no seu enquanto e na qualidade, Córdova é uma cidade lindas cheia historia conhecida e misteriosa, a mesquita é conhecida internacionalmente pela enorme beleza, , julgo que já existiram mais mesquitas na bela cidade, a que bem fotografou é uma mesquita dentro da outra, suas duas mesquitas, concorda? Stunning photography. I would definitely visit the church no matter how long I had. I love taking little trips with you through out the world. 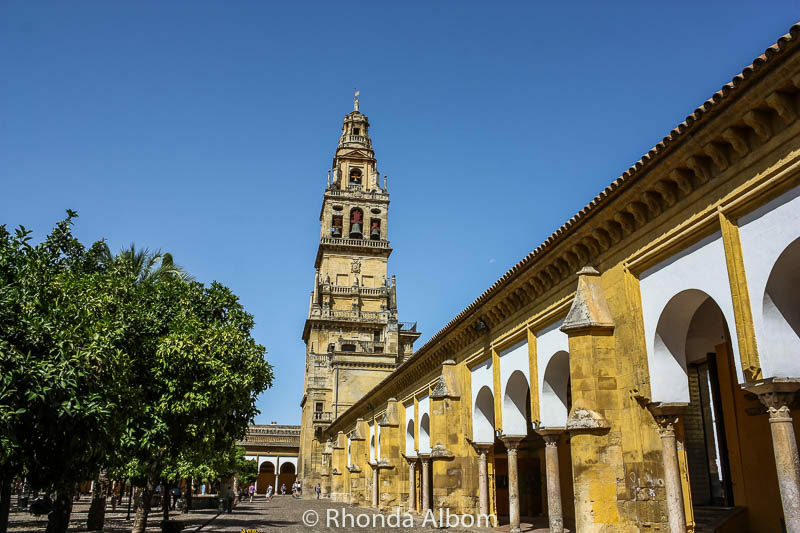 I think everyone who comes to Cordoba goes to the Mosque-Church of Cordoba. Such lovely photos! looks like an amazing trip. Travelling through Spain was full of surprises. Cordoba was one of the best. These are truly amazing photos, what a wonderful experience! Have a fabulous week where ever you travel….Be safe! 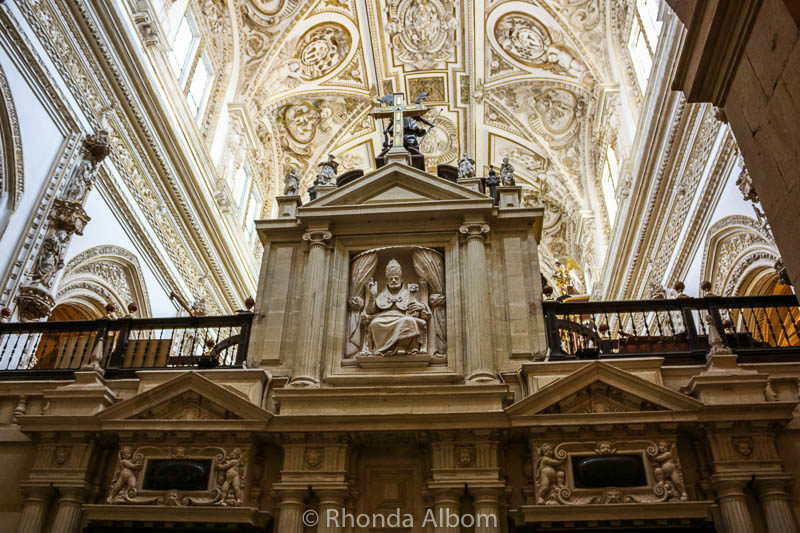 Wow, the Cathedral of Cordoba just got put on my bucket list. I’ve read about it before but your post really got my interest. It was similar photos that got me hooked originally. Spain is such a stunning country. I’ve been only to Barcelona, but I want to go back for a longer period to explore its different regions. Beautiful photos, Rhonda! Barcelona is fabulous, so based around the work of Gaudi. Cordoba is quite different. And the largest building is Catholic. Ironic. But very beautiful. I have some friends there now. This is their second time there so I’m guessing they like Spain very much. Oh, lucky friends. I would love to be back in Spain. Oh I want, want, want to see all of these. Bucket list items for sure. 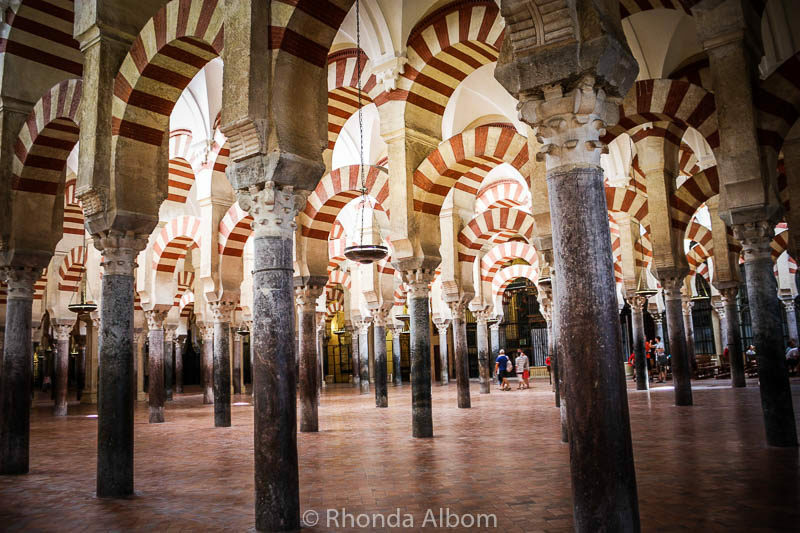 Cordoba really is a must see destination. Same for me when I looked through them to update the post. so beautiful! international art amazes me. i envy your brave travels! LOL – we didn’t feel very brave. Sometimes when I see such grand designs, I can’t help but wonder how many labor hours goes into creating the master piece. It is gorgeous. There must be an enormous amount of hours that went into the creation of the mosque. Wow. Never been – but I sure want to now. I love it all — the architecture is truly amazing and just stunning. The ceiling is absolute art. Everything about the place is truly amazing and just stunning. very fantastic photos, I love its history, very amazing stories related to it. That is impressive! It’s amazing that they built churches like that centuries ago – and that they are still standing strong. I’ve never been to Spain, but I saw plenty in England and Scotland. I loved both England and Scotland, but there is a special place in my heart for Spain. I remember my parents visiting Spain years ago and going on those tours. They had an amazing experience. There are plenty of tours that go here, but we opted to do it on our own. Beautiful photos!!! I studied architectural history in college and would love to go somewhere like spain to study all the beautiful, historic architecture. Thanks for sharing with us! I’ve linked up. There are so many places in Europe that would be ideal for an architectural study. I have never been to Spain but would love to go. I think the picture of the altar is my favorite. So much detail. Gorgeous photos. Thanks Patty. I love the red and white arches. OMG, that is so terrible. I am so sorry to read this. Gorgeous photos of the Cathedral. I love the ceiling photo. The photo of the alter is amazing – a lot of architecture to take in! Breathtaking, really. It is a magnificent mosque – church. That is one interesting looking building. I love all the details. I sadly have never been to Spain. So, pictures will have to do! Glad I have lots of them to share. I also haven’t visited this part of Spain, but would love to go! Gorgeous photos! Thanks Julie, I hope you get here. It’s such a fabulous city. I like all the shots! It is beautiful! I’ve been to cathedrals in Paris and Italy. Never Spain. Thanks for sharing! The cathedrals in Paris and Italy that we visited were all quite different then La Mezquita. I have never been to Spain… (humm reminds me of a song!) but my youngest son was sent there for work and my youngest BIL was in the air force for 20 years & spent quite a few of them there. It is also where he met his wife. I think the ‘old world’ has the prettiest architecture. Agreed. I love the medieval architecture. I think not, I visited Spain as a young child, but would have remembered those colorful arches had I see them. There are so many cool cities in Spain, maybe you just didn’t go to Cordoba. Spain is on my travel bucket list.. it’s so beautiful! Move it to the top of your list, Spain is fabulous. I’ve always wanted to go to Spain. Absolutely beautiful! Just beautiful. I have been to Europe, but our tour did not go to Spain. I have ancestral ties to Spain, and would one day love to visit. Too bad, it is a fascinating country. We spent 10 weeks in Spain. Wow! This cathedral is so beautiful! Great shots Rhonda. Thanks for sharing and hosting. Great pictures! Very impressed. Spain sounds like a great destination. I hope you get to Spain, it’s fabulous. I’ve been there! It’s gorgeous. Hi Rhonda .. I haven’t been to that part of Spain and so want to go .. and do a tour round at some stage. Those pictures are just amazing – the third one is just incredible and so fascinating to see .. now I want to go even more ..
It’s right down the centre of the country. 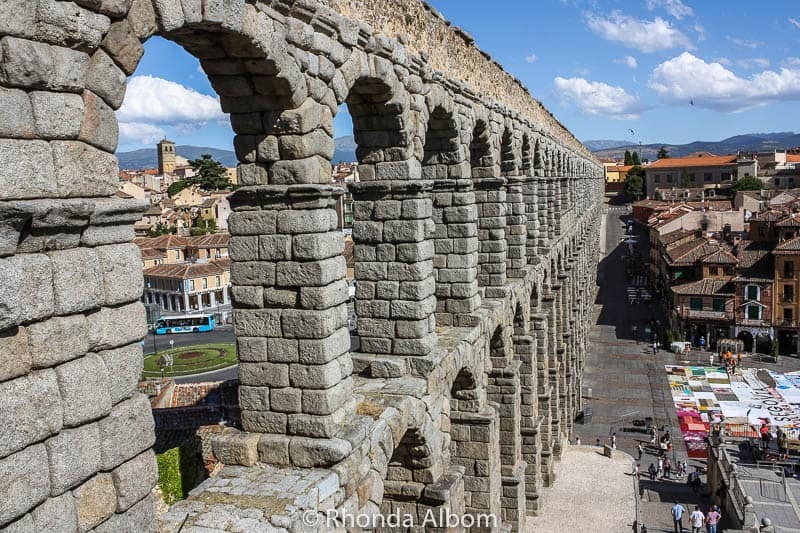 We went from Madrid to Segovia, then Toledo to Cordoba before heading to Granada. Asia and Europe are quite different. Breathtaking!! I just love Europe! My favorite photograph is the golden door shot. Beautiful. Thanks. There were so many different architectural features, it was hard to pick the photos to share here. I would imagine La Mesquita is exactly the same in 1986. Oh wow, that is breath taking. I have never been to Spain, or anywhere in Europe for any matter. Breathtaking is the perfect word. It leaves you speechless.